It has been another busy work week, so there isn’t really much news. There has been knitting, and cross-stitch, although not much that is photo-worthy. The never-ending shawl is still in progress. I’m half-way round the border though, so nearly there. Unfortunately there really isn’t much yarn left and I’m hoping against hope that it will be just enough. It’s still not good for photos…maybe when it’s blocking. Although it did occur to me the other day, where on earth am I going to block something that big?! If you can make out the faint pencil writing, you’ll see it describes what the piece is, who for, the pattern source and details about materials and framing/finishing. I also had to add the ‘By’ bit at the bottom, because A got interested so I taught him how to cross-stitch. 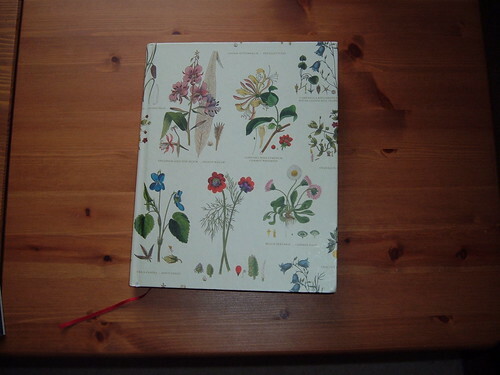 He was quite prolific for a while, so I started putting his stuff in the books too. One year we made a whole stack of xmas cards between us (see below for photo). 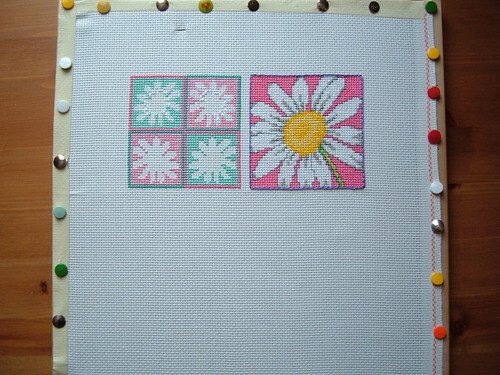 The books don’t contain all of my cross-stitch work, not by any means. 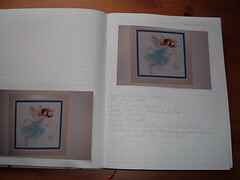 I only started taking photos in 2005, but I’ve been stitching since I was 15! A cushion made for a nephew – now fought over by 3 nephews! 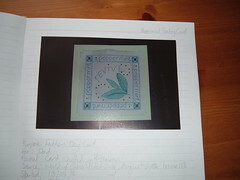 A Father’s Day card for my dad, the cross-stitch piece on the front forms a pouch, into which I tucked a couple of peppermint tea-bags. A fairy for A’s Mum. This one was huge, it used a dozen shades of blue cotton and several blending filaments in very similar shades. It was really difficult and time-consuming, but worth it in the end. 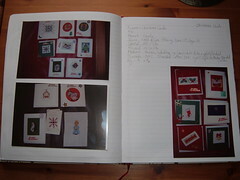 Yes, I realise that taking photos of photos is a bit odd, but it gets across nicely the value of the ‘broidery books. I love that I can look back through the pretty things I’ve made. 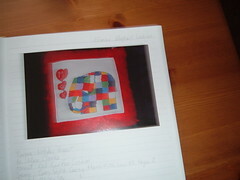 And it can be really useful, for example to check what birthday cards I’ve made someone previously. I have one final picture, but it isn’t a happy one. That is one of my amazingly warm alpaca bedsocks. See the big hole where the heel has worn through? I could have cried when I spotted it last night 😦 . 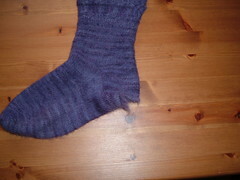 Still, they were made out of a soft yarn, not a sock yarn, and they have had a lot of wear. The other one is also very thin, but not quite worn through. I might attempt some kind of darning or something, or try to replace the heel if such a thing is possible. Might as well, I can’t just throw them away. Edit ot add – somehow I don’t seem to have published this last week, no idea how that happened, but here it is! 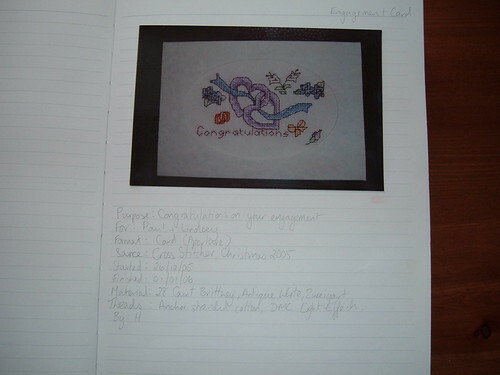 This entry was posted on November 7, 2009 at 11:45 am and is filed under Cross-Stitch, knitting. You can follow any responses to this entry through the RSS 2.0 feed. You can leave a response, or trackback from your own site.